A Series of Airy Spaces Cascade Down the Natural Slope of This Block - BuildHer Collective. The new upper storey is clad in zinc and cantilevers dramatically over the rear courtyard, shading the windows during summer. But the renovation of this Victorian-era home isn’t all for show, it’s an eco-friendly, 7 star energy rated home that feels comfortable all year-round. And if you’ve just suffered through a Melbourne winter you’ll know that’s a big deal! The courtyard is a generous outdoor space in a dense inner-city suburb. Facing North it is a beautiful, sunny space to sit. Perforated steel boundary walls let in dappled light, but protect the courtyard from passers-by. Painted black, the walls create a striking backdrop for lush green vegetation. Inside the spaces are minimal, pairing grey timber with pristine white walls. Large North-facing windows bring plenty of light into the home, even on overcast days like the one pictured. On the ground floor, connecting to the courtyard is the kitchen and dining area. The dining area is double-height which helps it to feel more open and spacious. Up a half flight of extra wide stairs is the living room with a cozy fireplace. Up another half flight of stairs is a study landing that takes in a nice view of the courtyard and the dining area below. The stairs become a focal point in the home, cascading down levels and working just as well as informal seating. Although you can’t hear it from your iPhone screen, the architects engaged acoustic consultants to ensure the home feels like a tranquil retreat – despite being in a busy inner-city suburb. Combined with the minimal palette, this really is a retreat in the city. In the original part of the house, the ground floor bathroom has an unconventional plan to ensure the original window is retained. Again, taking advantage of the fall of the site, the bath is partially sunken for easy access. A laundry and a bedroom are also included in the front two rooms of the original home (not pictured). Jumping upstairs to the new zinc-clad addition there’s another bedroom and a drying room, plus the master bedroom suite, containing a bedroom with a view to the North over the courtyard (not pictured), walk-in-wardrobe, and ensuite bathroom. The ensuite wall continues the pattern from the courtyard, injecting some personality into the minimal palette. 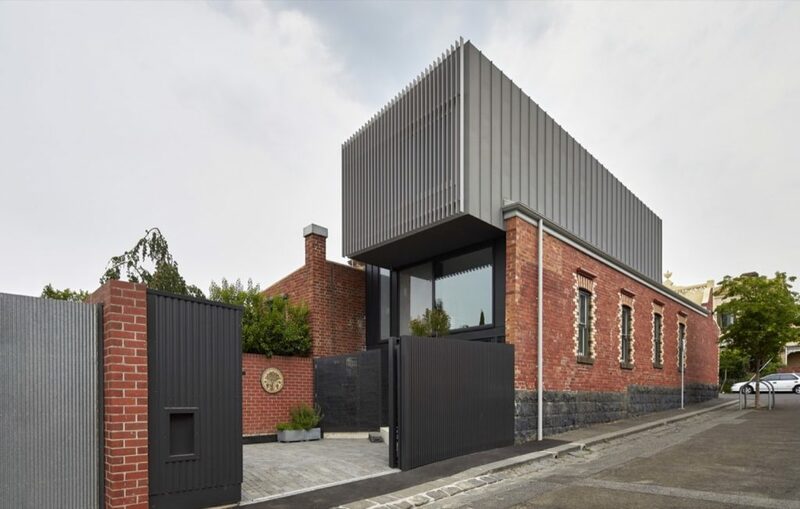 Fitzroy House is more than a regular extension. It works with the site to create a connection to the outdoors and embraces a Northern aspect for maximum light. More importantly, the project is designed with energy efficiency in mind, so for minimal effort the home is easy to keep warm during winter and, equally, cool in summer. The home is casual and its series of open-plan spaces flow effortlessly from one to the next, making it feel much more spacious. Perforated steel boundary walls let in dappled light, but protect the courtyard from passers-by. Painted black, the walls create a striking backdrop for lush green vegetation. Alternating floor materials define spaces within the home. The polished concrete that begins in the kitchen and extends outside into the courtyard highlights the cooking and entertaining areas. Zinc is an ideal material to be used as cladding. It is much more resistant to corrosion than steel, but still weathers to a beautiful patina.